This king is in style, at least for now, with his beard. What about a mustache? Don’t they usually go together? Will your kids notice this? There are lots of k’s for them to notice in the alphabet frame of this letter identification worksheet. I think your kids can find and circle all 12 of them. Hint: There are three on each side of the frame in uppercase and lowercase letters. 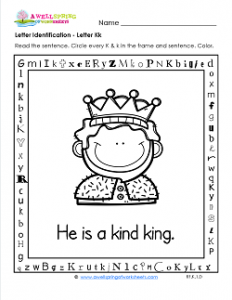 Don’t forget to circle the k’s in the sentence “He is a kind king.” Be cool and color him kindly. There’s a hidden sight word in the top of the frame. It’s the word “big”.